Earthfall, the Sci-Fi cooperative shooter for up to four players in development at Holospark, will be available on July 13th for PC, PlayStation 4 and Xbox One. Gearbox Publishing will take care of retail distribution. The press release includes a few statements from key executives of both Holospark and Gearbox Publishing. We are excited to bring Earthfall to PlayStation 4 and Xbox One on July 13. By partnering with Gearbox Publishing on a physical release, even more fans will be able to get their hands on Earthfall on launch day. We’ve been hard at work on Earthfall since it first launched in Early Access last year, and we’re really proud of what the game has become. Our thanks to everyone that played Earthfall and shared their feedback, whether that was on Steam or in-person. You’ve helped make the game what is it today. 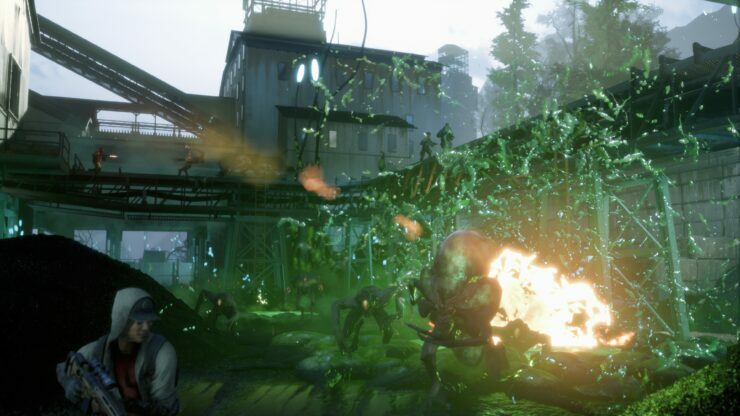 Once we got our hands on Earthfall, we couldn’t stop playing it! It’s the modern co-op horde shooter we’ve been missing for so long. We knew it was the perfect addition to our growing publishing efforts at Gearbox. We are excited to be working with Holospark’s talented group of veteran developers to bring the amazing co-op experience of Earthfall to retail this summer. The game has been available on PC via Steam Early Access for over a year (it launched on Valve’s digital platform on April 26th, 2017). So far, user reviews are quite positive with an average approval of 79%. At launch, players will face off the Alien invasion in the Pacific Northwest across ten missions and two separate campaigns. The price is set at $29.99, with a Deluxe Edition available at $39.99 and packed with exclusive weapon skins and biohazard suits for the characters. Gameplay Trailer of “Vanquish” Revealed.